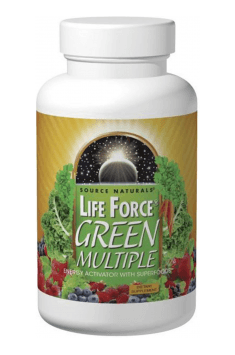 Life Force Green Multi 180 tab. 3 to 6 tablets daily with meals. Do not exceed suggested use. In case of high exposure to the factors that may lead to the deficits of vitamins and minerals (stress, increased physical activity, drugs), the dose should be increased to 4-6 tablets a day. For people who use diverse and balanced diet, 1-3 tablets a day may be sufficient. The best benefits resulting from taking the preparation may be achieved by daily, regular supplementation. The preparation may be used both by women and men. Because of the fact that there are the components soluble both in water and fats, it is best to take the product around a meal. Pomegranate fruit extract – contains two substances valued for their health-promoting properties. First of them, punicalagins, are compounds from the group of ellagitannins whose molecules are quite big. They show strong antioxidant properties, both autonomous and thanks to its metabolites. They promote reduction in oxidative stress which is a factor stimulating cells apoptosis. Punicalagins can also reduce the risk of prostate cancer. The second active component of the extract is punicic acid, also known as omega-5. It shows the ability of lipid profile optimisation. At the same time, it can increase the level of “good” HDL cholesterol and reduce the amounts of triglycerides in blood. The pomegranate extract cannot be used together with preparations enhancing libido, as such a combination increases the risk of prapism effect (long and painful erection). Artichoke (Cynara scolymus) - a plant of the Asteraceae family, rarely cultivated in Poland. The raw food material is its inflorescence (Inflorescentia Cynarae) and herbs (Cynarae scolymi). Inflorescence and herb provide a lot of substances, such as proteins, cynarin, flavonoids insulin, carotene, polyphenolic acids, triterpenes, carbohydrates and vitamins (B1, B2 and C). It is anti-inflammatory, antioxidant, and diuretic and choagogne, lowers LDL cholesterol (by reducing the activity of the enzyme HMG-CoA reductase, it protects the liver, is antitoxin for carbon disulfide (Cynareina.). It is used in the diuretic preparations, in rich in proteins and carbohydrates and vitaminizing supplements. Improves insulin metabolism of the pancreas., used as a component in pro-health supplements supporting digestion, lowering cholesterol levels, herbal blends (in combination with extracts of. milk thistle, B group vitamins, and others).